Are you seeking for Highest Paying URL shortener sites that really pays you? Well, this is common topic already talked by various online form, webmaster and blogger with their detailed features (how do they work, how much they pays, are they legitimate or not, etc.) along with their work experience and payment proof. Well, we all including Blogger, YouTuber, Digital Marketor, Reviewer, or an Influencer likes to earn some extra penny with little efforts. Today we will be sharing some very popular, best revenue sharing, trusted and highest paying URL shortener website with little information about them. First of all we want to explain about what are URL Shortener Sites and how to earn with them? Well, the concept is straightforward and easy. For example, you have a long URL i.e. 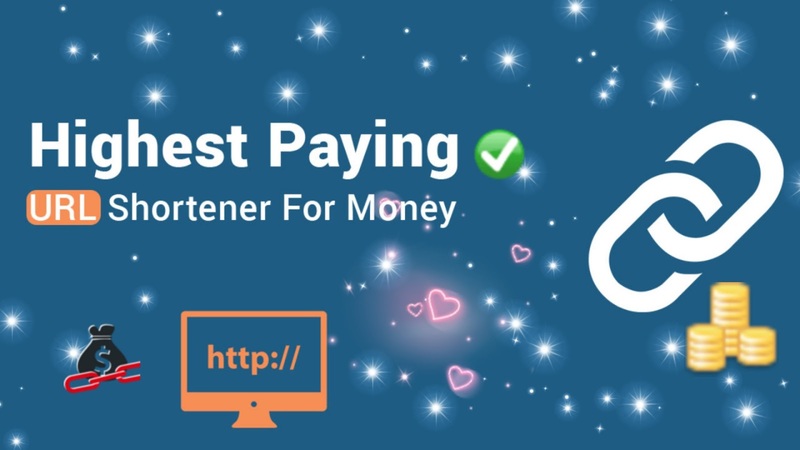 - https://www.onlinekhabar.com/2019/04/758773 and with Paid URL shortener you can convert long URLs into short link like this - https://goto.com.np/gr5EjPO. When you share your shortened link with your friends into various Social Networks, Chat, Online Community, Forum, SMS, Email or other way; your friend or someone clicks on your link. Then, he/she will get redirect to a new custom page (may or may not be encrypted). On this page, the user will be shown some advertisement for 5-10 seconds which varies from one to another. URL Shortener Network sets different advertising campaign by third party advertiser and they share some percentage of revenue with you which they got from their advertiser and that is your net income. Following listed sites are most popular and widely trusted Best URL shorteners which pay well. You can make good money from these sites. You just need good traffic that leads CPA. If the traffic is from European countries like USA, US, Canada, Australia, UK, etc. then you’ll be paid high amounts as per their advertising cost policy. Adfly is the oldest and best legitimate URL shortener sites in the market. No list gets completed without Adf.ly. Additionally, you can trust this website blindly. Because it is still users favorite and it always pays on time. Now talking about the money and views, then one can easily earn upto $5 to $10 on approx 1K link views. User can withdraw their money on every 10th date of the month. Minimum Withdraw amount for PayPal is 5$, and for Payoneer, they pay out at minimum 20$ to the users. Goto URL Shortener (goto.com.np) is nepalese highest paying url shortening service with good PPC, RPM and eCPM rate till this date. You can earn upto thousand rupees (about $10) on daily basis with the help of visitor you delivered through their links. They pays upto Rs. 500 per 1K traffic. If you bring traffic from europen regions you will surely earn good money with them. It requires only Rs. 100 ($1) to withdraw money into account wallet and online topup recharge especially dedicated for nepalese telecommunication (Ncell, NTC, UTL, Smart Cell, etc.) Users can also withdraw money in their Local Bank Account, ESewa Wallet and Khalti Wallet. Moreover, they pays with Cheque, IME Money Transfer, Western Union Money Transfer and user prefered method when your balance reach Rs. 1000 ($10). Aditionally, they pays international user via PayPal (not recommended as PayPal is not legally allowed in Nepal), Google Play, Payoneer, Skrill and Paxum. You can blindly trust Goto URL Shortener but never try to generate fake traffic using proxies and bot method. They keep your account into suspicions list if you bring more than 50% of real referal and organic traffic. As per our experience, they pays more to YouTube, Quera, like referal traffic with manual reviews. Shrtfly is another paid url shortener website you can trust. It pays upto $3-$14 for 1K views. It is good in comparison with the other sites mentioned in the post. Shrtfly is a trusted website. It is one of the highest paying URL shortener websites. Shorte.st is also one of the famous and old URL shortener website. It has a lot of useful tools and ways to make long URLs short and earn money. If you are a blogger, then you can also use their WordPress plugin which will help you to increase your earning. With Shorte.st you can make up to $5-$15 for 1K link views/clicks. You with be able to withdraw your money with a minimum payout of 5$ in PayPal, $20 for Payoneer and $5 for WebMoney. Every month on 10th date, the payment is sent to the users. LinkShrink is also in the best, highest and trusted URL shortener service provider list. You can easily make $3 to $5 on 1K clicks on your short URLs. LinkBucks is another legitimate and best website for earning money through short URLs. It is also a great alternative of Adf.ly and shorte.st. LinkBucks pays users between $1 to $7 for approx 1K link clicks. This Price keeps differing from locations of link clicks. The minimum amount of withdrawal at LinkBucks is only $5. Ouo.io is also another best and highest paying URL shortener you can trust and easily make money by sharing short URLs on verious onlind forums and websites. The minimum amount of withdrawal in ouo.io is only $5. They give payout on every 1st and 15th day of the month. Users can receive their money in PayPal and Payza. If you are into URL shortener, then you must give a try to CPMLink.net. It is also one of those URL shortener services which has grown very fast and develop trust among users. Signup CPMLinks for a new account and start shortening long URLs. Share your links over the internet and get money when people click on them. CPMLink gives approx 1-5$ for 1K link views (but differs from country to country). And they pays money to their clients on daily basis via Paypal and bitcoins. Linkzfly is Bengali url shortener service. It also one of the best link shortener to make money online and it comes as a free tool and allows you to shorten links. They offer best publishers rates between $3.50 to $12.5 per 1000 views depending upon the country. Moreover, in some countries, it can go up to $14 per CPM. Don’t underestimate and ignore this website, as it is last on the list. Al.ly can also help you to make some significant amount of income just sharing short links. Their most remarkable part is minimum withdraw requirement that is is only $1. User Can receive money in Paypal, skrill, Payoneer, and payza. I hope you will be trying all of the above mentioned Highest Paying URL shortener websites. And If you know any other trusted and best URL shortener then let me know in the comment section without scam nature. If you have any doubts, then leave them in the comment section. If you find this post helpful, share this post on whatsapp, facebook and other platforms so that they can also learn this.